We are a renowned firm, which is engaged in undertaking Turnkey Projects on Installation, Integration, Testing & Commissioning Of Flow & Level instruments. The offered services are rendered by proficient personnel, who ensure to use commendable knowledge and rich experience in this domain. Along with this, these projects undertaken by us are completed using modern machines and innovative technology. 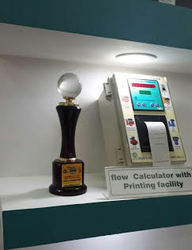 We are a reputed firm, which is engaged in exporting a wide assortment of optimum quality Flow Meters, Level Instruments, Fuel Dispensers, Ultrasonic Water meters. The offered range of products is procured from the leading names of the market, who manufacture it compliance with the international quality standards & norms. A competent team of professionals is supporting our firm as a backbone. These professionals possess the vast knowledge and experience of respective domain and help us in providing best quality Flow Meters, Level Instruments, Fuel Dispensers, Ultrasonic Water meters. Further, our adroit procuring agents help us in associating with the leading manufacturers of the market. With the help and support of our deft professionals, we have been able to win the trust of our worldwide customers. From the time foundation stone of our firm was laid, we are working hard to working hard to meet the every minute requirements of patrons. For the same, we are offering an incomparable set of Automation Project Services. Offered service is rendered by our diligent professionals, who possess impeccable knowledge of industrial automation control systems. Further, while execution of offered services, our professionals make use of optimum quality tools, equipment and sparer parts. Our experienced professionals keep the requirements of the clients in mind while rendering offered services and also assure the timely execution of undertaken projects. We have participate in the exhibition of Mining Mazma in Bangalore on September 8, 2017 and We have got Best Technology Performance award. In order to provide our customers best quality Flow Meters, Level Instruments, Proximity Switches, Data Loggers and Dispensers, we have associated ourselves with the renowned manufacturer Teltech. It is a joint venture company with ALMA Ingenierie, France. Our business associates enable us to meet the diversified requirements of clients. Further, our associates are widely acknowledged in the market for manufacturing the best quality products. They manufacture offered array of products in complete compliance with the international quality standards & norms. Ours is a renowned organization, which is engaged in manufacturing and supplying a broad spectrum of excellent quality Flow Meters, Level Instruments, Proximity Switches, Data Loggers and Dispensers. These products are procured from the renowned manufacturers of the market. Offered range of products is manufactured using optimum quality raw material and components. Further, these products are known among the clients for their longer functional life, corrosion resistance and trouble-free performance.